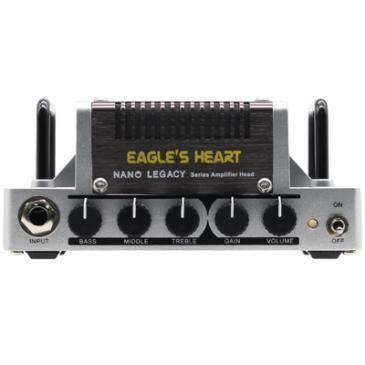 Eagles Heart is a micro-amp head that takes inspiration from the ENGL Savage 120*. It weighs in at 440 grams and includes a 3-band EQ, FX loop, headphone jack and aux in for routing in external music devices such as an MP3 player or smartphone. *The mentioned manufacturers and product names are trademarks or registered trademarks of the respective owners. The trademarks were used merely to identify the sound character of the products. We are motivated by technological innovation, we see excellence in quality as a competitive strength and we believe in outstanding service as the foundation to provide every musician with a sensational experience. As ideas become designs, the Hotone team buckles down to create products the music world has always wanted but never before imagined possible. Expect from Hotone products innovation, ingenuity and always great tone.